In this DVD training, Jerry Lamagna explores the challenges and opportunities of working with clients who struggle with affect regulation. Using video footage of actual sessions spanning a seven month course of treatment, He introduces viewers to AEDP’s moment-to-moment tracking of experience linked to the client’s past, to meaningful relational contact with the therapist and to the felt sense of change itself. In particular, Mr. Lamagna highlights the use of intra-relational techniques that activate affective change processes associated with moments of self-recognition, regulation, understanding and self-compassion. 2) Nearly three hours of annotated, clinical video footage chronicling AEDP work with pathogenic affect, core affect, transformational affect and core state. The video material includes lengthy segments of six sessions with a single client over a seven month course of treatment. 5) A companion paper to be published in an upcoming issue of the journal Transformance that provides more theoretical depth to the ideas presented in the workshop. 6) The potential for earning 6 continuing education credits for $20 through R Cassidy (CEUs awarded upon passing of accompanying test). [The application for obtaining these hours is pending but should be finalized in the coming weeks). CE are for Social workers, MFT’s and Psychologists nationally and for social workers in NY and NJ with the exception of CE for MFT’s in Massachusetts and Minnesota and all counselors in Alabama, Arkansas, louisiana, Oklahoma and West Virginia] . 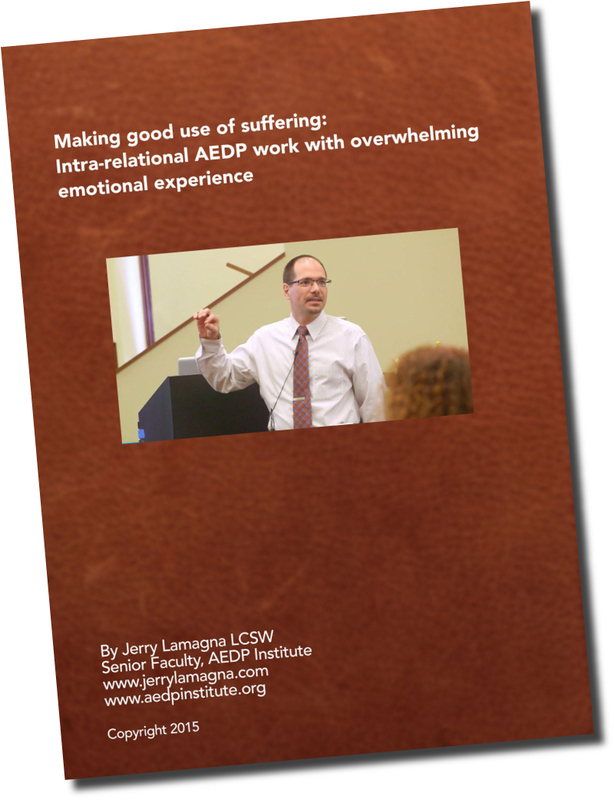 Together, the materials provided offer an excellent resource for the study of AEDP’s four state transformational model, Intra-relational AEDP and related therapeutic interventions. The DVD illustrates AEDP’s potential for rapidly relieving psychological suffering and promoting more optimal mental functioning. After you’ve viewed the DVDs click here to pay for CE’s and take the online test.